Time to Celebrate! Mt. Ashland is open! Survival of a ski resort when summers are smoky and winters iffy calls for more than packed snow; it calls for being ahead of the pack. Environmentally aware and STOKES certified, Mt. Ashland, the once struggling ski area, has evolved into an industry pacesetter. While Towle and other Mt. Ashland advocates have been busy focusing on the mountain’s ecology and recreational stability, visitors have been busy enjoying the changes. The 2017 remodel of the lodge created better flow, more seating and panoramic views while increased low-snow operations allowed for an earlier opening. Closure for high winds rallied a network to help keep people on snow. At its 6000 foot elevation, the ski area is often above clouds and smoke and stays 20 degrees cooler than the valley on sweltering summer days. “People love getting married up here; it’s one of the most beautiful views in the great state of Jefferson,” says Towle, hoping to see more event organizers take advantage of the locale. Fresh Pow, a new seasonal IPA from Block 15 Brewery out of Corvallis, has become a favorite at the T-Bar in the lodge’s upper level. The can features an original design by local Flow Factory custom artist, Chris Herbst, with Mt. Ashland prominently displayed together with Mt. Hood and Mt. Bachelor. Bavarian Nights, the annual fundraising event for the Mt. 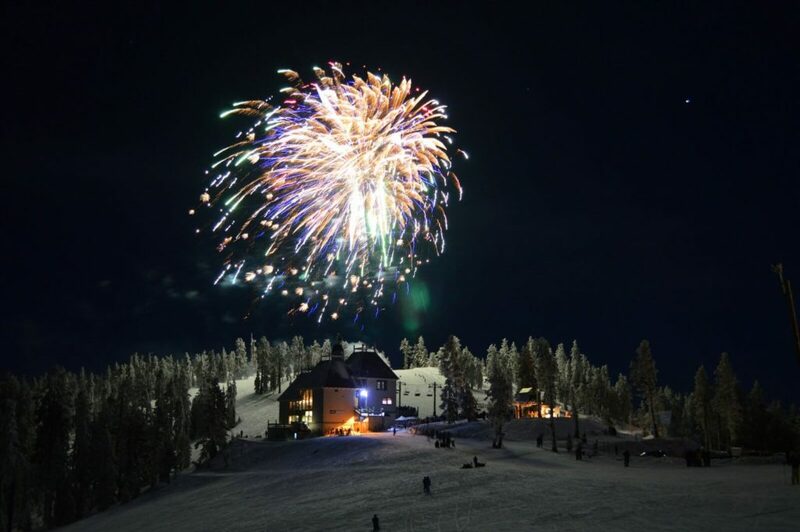 Ashland Ski Patrol will be February 16, with live music by Danielle Kelly Soul Project, $25 night skiing, a $500 Rogue Ski Shop gift card prize and a giant fireworks display by Sure Shot Fireworks out of Bend. Another crowd pleaser is the Dummy Downhill Race scheduled for March 16. Participants bring a homemade dummy on skis or a snowboard and launch it off a giant jump. It’s free to enter and prizes go to winners scored on originality, how straight the dummy goes, height achieved and the landing. The adult Race Leagues have returned this season and Towle encourages interested speedsters to visit their website to learn more and get signed up for upcoming races in February and March. Five live webcams, an email newsletter, text alerts and daily Facebook live reports keep snow enthusiasts updated round the clock. “Our free snow bus was such an amazing success story over the holidays,” he adds.